When a new advertiser enters the world of PPC, it can be seen to be a bit daunting with all these new concepts and keywords within online advertising. Therefore, it makes sense to get an idea about what PPC is about before you set off with your own campaign. Here are the main and most important keywords within pay per click advertising you will need to know and understand. CPC: Cost per click – This is the maximum price you will pay for a click on your advert. Choosing your CPC is important and can affect your campaign alot. Here are three reasons you might want a high CPC. CTR: Click-through ratio – The click-through ratio is the percentage of web users that click upon your advert after viewing it. For example, if you had 100 impressions on an advert and had a CTR of 1%, you would have had 1 web user who had clicked on your advert. 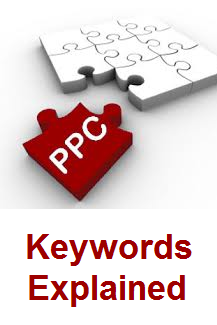 Keywords – PPC advertising is different to other formats for the reason that it is contextual. By this, I mean that you can make the websites you are going to advertise on linked to the same category/genre as your adverts. Keywords are the way PPC is contextual. Choosing the right keywords for a campaign is extremely important to the success of it. The more the keywords are related to the campaign, the better. Conversion rate – This statistic measures ultimately the success rate of your campaign. If you are able to accomplish your objective with one web user be it by getting their email address for email marketing or by getting them to buy a product or service, it counts as one conversion. Landing page – The landing page is the page the web users will ‘land’ on after clicking on your advert. It the place where you will produce a conversion rate for your campaign. Now, it should be noted that there are many different types of landing pages to choose from. Therefore, pick wisely. Text advert – Text adverts in PPC evolve around a structure of three: the headline, description and URL. Image advert – An image advert has more freedom than a text advert which usually produces a much better CTR for advertisers. There is still an argument about which format is better, text or image? With PPC, there is one program you have to try being Google AdWords. There are many reasons I can list for you to use AdWords. However, one of them has to be because of the support you will get when using it. Most websites when they talk about PPC will somehow relate it to AdWords (like ppc.org does). Therefore, you are never a click away from assistance. As well as learning the keywords of pay per click advertising, it might be helpful too to read a few tips about PPC. Here are 14 tips to PPC.